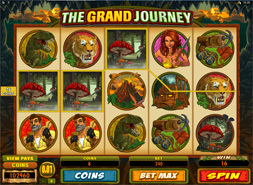 An epic adventure awaits slots players in Microgaming and All Slots’ latest offering, The Grand Journey! Promising big wins and striking graphics, Microgaming’s latest five-reel, 30-payline title is now available to play at All Slots. The first thing you’ll notice about The Grand Journey is the strength of its styling. Set in a jungle where even Indiana Jones would lose his cool, the perils you’ll face include active volcanoes, Amazon warriors, sabre-toothed tigers and even dinosaurs! This rich styling is backed up with some good use of technology. The soundtrack is sufficiently atmospheric, and in keeping with the adventurer theme. Likewise, the symbols are all wonderfully animated, giving even the smallest wins a real sense of occasion. Collecting two or more scatter bonuses will see you win the maximum bet; collect three or more, and you’ll enter the free-spin mode. This gives you 15 automated free spins, but with a twist. Whenever a spin doesn’t find a match, the score multiplier kicks in. This increases with each failed spin, until it reaches times-ten. That said, you shouldn’t have a problem coming by winnings. Thanks to the stacked and expanding wilds, winning combinations are never in short supply. This is especially true when placing maximum bets. The fact it’s a Microgaming title in itself will be a major draw for experienced slots players. Microgaming has developed some of the most popular slots games in recent times. This includes both the Thunderstruck games and Immortal Romance, which launched in December 2011. The Grand Journey is available to play now. Trust us, this is one epic adventure you won’t want to miss out on!